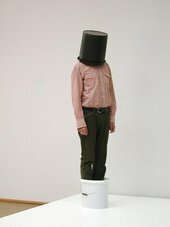 During an exclusive out of hours viewing of Performing for the Camera featured artist Erwin Wurm invites you to make a One Minute Sculpture. Through his work Erwin Wurm questions and reflects on sculpture itself, seeking to overcome its restrictions, limiting its life time to one minute only. Using everyday domestic objects and found furniture, Erwin creates situations and instructions that allow you to become an artwork for sixty seconds.